First, let me fill you in on the levels of autonomy for a vehicle as set by the standards organization, the Society of Automotive Engineers International. There are six levels of autonomy, from zero for absolutely no autonomy to Level 5, which would be complete autonomy. In other words, completely controlled by computers. This technology is probably a decade away. Level One: Driver Assistance: At this level, the automobile includes some built-in capabilities to operate the vehicle. The vehicle may assist the driver with tasks like steering, braking or acceleration. For several years now cars have been manufactured with controls on the steering column that allow the driver to maintain a constant speed or gradually increase or decrease speed. These functions are enacted by the driver and not automatically performed by the automobile. Most modern cars fit into this level. If your vehicle has adaptive cruise control or lane-keeping technology, it’s probably at level one. 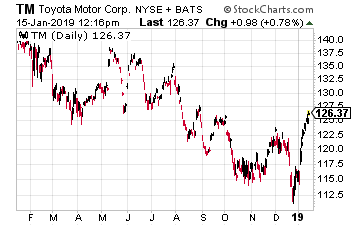 I do like Toyota Motors (NYSE: TM) because it seems to be moving on its own independent path, separate from the other automakers with regard to new technologies. I like their skepticism toward Level 3 vehicles. 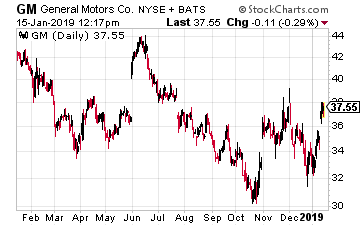 And their skepticism toward electric vehicles is interesting. Instead, it is concentrating its efforts on both solid state batteries and fuel cell vehicles. I will be discussing Toyota’s and Japan’s move toward a hydrogen economy in a future article. 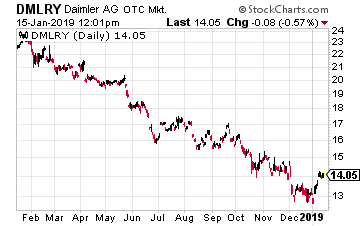 And Daimler is heading straight from level two to level four, in which a truck can operate without user intervention on specific routes because the company says level three “does not offer truck customers a substantial advantage”. Unlike Tesla, it considers Level 3 to be a dead end since it would have to rely on human attention during the crucial 1% of the time after telling the driver not to pay attention 99% of the time. With truckers on long haul routes, I see sleep and Level 3 not being compatible. Its Level 3 system is better than Tesla’s. GM also built a slew of additional safeguards into Super Cruise to try to ensure that it’s only used in circumstances it can safely handle. For example, if the vehicle isn’t on a highway, the road’s lane markings aren’t clearly visible, or the system thinks that the driver isn’t fully attentive – it won’t even switch on.